Does your life lack luster? Has it been a while since you’ve smiled, laughed, or had fun? Feeling down stomps on your self-esteem and depletes your energy level to the point that you feel too fatigued to accomplish anything. In today’s world there are many reasons that cause you to feel down, and giving power to those reasons may put you into a downward spiral. You believe that you can’t feel any worse, but keep allowing yourself to feel down and you’ll find that you can feel worse. Depression is debilitating, and can affect every aspect of your life. According to the National Institute of Mental Health 20 to 25% of adults suffer depression at some point during their lifetime. If you feel you believe you suffer from clinical depression, seek professional help immediately. Many issues or situations can cause us to feel down. We can usually attribute it to feelings of grief, isolation, loss, hurt, or self-doubt to name a few. It’s important to feel these feelings, and work through them. But often people turn to destructive behaviors to numb feelings, causing long-lasting distress in their life. When situations arise to cause bad feelings, be constructive and not destructive with your thoughts and actions. With time, you’ll find happiness will once again be apparent, and you’ll find resilience within. 1) Eat Smart: When you eat poorly you feel poorly. When you feel down you may not stop to think how your food is affecting your mood. In today’s fast-paced life, too many people eat food-like products rather than food that is nourishing. Choose your food from all food groups, ensuring that you get vital nutrients for well-being and sharp focus. Refer to my Five-Finger Food Guide for guidance. You can also eat eggs, sour cherries, fish oil, and flax seed to help increase serotonin levels which some researchers state is the chemical responsible for maintaining mood balance. 2) Sleep: Sleep is the best way to reset your brain. When our mood is one that borders on depression it is often hard to quiet our minds and rest our bodies. Keep a pad and pencil on the bed-stand. Write out all of your pressing issues on the pad and leave it on the bed-stand. The issues will still be there in the morning, but leaving them on the bed-stand allows you to free your mind and fall asleep. The pencil lets you to erase them as they disappear from your life. This process allows you to realize that issues will pass with time. 3) Be willing to sit in silence: Whether you meditate, pray, or listen to your thoughts, sit in silence for five to fifteen minutes. Get in touch with your inner thoughts, because your thoughts dictate your feelings. You can then effectively address your thoughts by prioritizing their importance and eliminating the destructive, self-defeating, or exaggerated ones. 4) You don’t need all the answers: You may not have all the facts and are not aware of all the variables in a situation. You don’t need them. You do need to control your reaction to what you do know. Trying to control the uncontrollable makes you feel weak, but knowing what you can control, and doing so, makes you strong. 5) Exercise: There is no pill you can take, drink you could drink, or food to eat that will relieve stress and build resilience like exercise. It does not have to be organized, and you need no equipment, you just need to do it! Do it even when you least feel like it. 6) Practice self-care: Shower each day. By doing so you are not only cleansing your body but also your mind. Water and the sound of water will spark creativity. Dress in clothes that fit well and make you feel special. Use your appearance to show your appreciation for life and at the same time, your confidence level. 7) Start to laugh again by yourself and with others: Spend time with upbeat people and find humor in all situations; it’s always there when you look for it. Look at the bright side in each issue, for even in the midst of a storm, the sun rises. You know you have found humor and seen the light when you feel levity and others laugh along with you. These constructive behaviors change the way you face issues and ushers in a healthy lifestyle. I won’t say this is easy, nor does it come naturally. It takes practice. 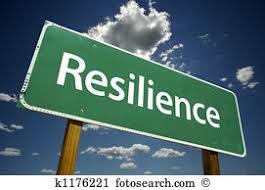 When you manage thoughts and feelings with the least amount of destruction to your life, you are resilient. Amtrak, Pepsi, The Mets Organization, JDA, Amex, Metlife, Cannon USA, National Grid, Fort Hamilton USAG, Time Inc, Time Warner Music, Verizon, Morgan Stanley, KPMG, Fordham University, Hofstra University, The New York College for Health Professions, Molloy College, St. Francis Hospital, Winthrop Hospital, Royal Caribbean Cruise Lines and Princess Cruises. Contact Margaret Marshall to bring wellness to life, at your next event.